Previous: How Long Do Braces Take to Work? The first step in the process is to assess whether you are a suitable subject for dental implant surgery. The dentist will carry out a careful examination of your mouth to assess the health and condition of your teeth and, in particular, your gums. Dental X-rays will be essential, and the dentist will take them throughout the process. Because your implants will be fitted directly into your jaw-bone, the dentist must be sure that the bone is strong and healthy. The dental X-rays also provide a picture of the places where the bone is most easily able to accept the implant. In some cases, a bone graft can be carried out to increase the amount of bone in your jaw. If you happen to have a longstanding problem with gum disease, you may not be able to have dental implants. Smoking can cause problems, and if you have either diabetes or osteoporosis, the dentist may suggest an alternative treatment. Having decided that you are a suitable subject for dental implants, the dentist will proceed in one of three ways. It may be possible to fit the implant at the same time as the teeth the implant will replace are extracted. The implant rod itself goes directly into the jawbone. It contains a screw, called an abutment, which holds one or more artificial replacement teeth firmly in place. The dentist may fit the rod and abutment at the same time or may leave a week or so between processes. Alternatively, it may be better to give your gum time to heal fully before fitting your new teeth. In this case, a small denture will be made to fill the space between your existing teeth, and you will be able to eat and smile. Dentists usually carry out implant procedures using a local anaesthetic, so they are not painful, but the anaesthetic itself may affect you. Some patients report finding the sound of the implant and its abutment being screwed into place rather strange. A general anaesthetic may be more appropriate in some cases. Your dentist will have made every effort to match the colour and shape of your existing teeth so that your implants will appear natural. When your new teeth are in place, you will need regular check-ups to ensure that they have settled down properly, so expect to see your dentist fairly frequently in the first year. Caring for your dental implants is usually straightforward. Just follow your dentist’s advice. 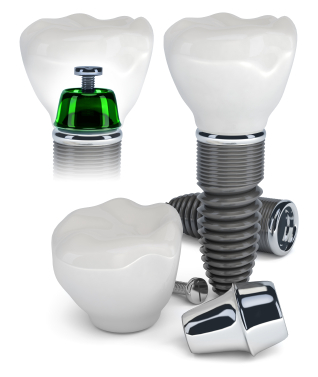 The dental implant process can take several months, but your implants will last you a lifetime.